The many Germans who settled in this area became known as “Pennsylvania Dutch”. The first Benitz to arrive was likely Andreas Benitz in 1827. He was from the village of Ibental (east of Freiburg) and not closely related, if at all, to Benitz of Endingen. During the 1830’s and 1840’s, several Benitz from Endingen settled in north-eastern USA, mostly in Pittsburgh (Pennsylvania, USA) and the surrounding area. Many were children of Anton Böniz (master cooper) and Maria Anna Wagner. In the US census records, “Benitz” is spelled in a variety of ways (Bönitz, Bennitz, Bennittz, Bennetz, Bennettz - and sometimes anglicized with the Z replaced by an S) but always at the same addresses. Franziskus Baumann was born 6 February, 1853, in Endingen (Baden, Ger. ), the son of Xaviar Baumann and Appolonia Benitz. In 1874 he emigrated to the US, became a brewer in Pittsburgh, then a hotel owner before becoming a successful fruit farmer. He married Augusta Schuahmann (from Prussia), they had one daughter (Emma) and adopted another (Lizzie). Anton Benitz was born in 1803, in Endingen (Baden, Ger. ), the son of Anton Böniz (master cooper) and Maria Anna Wagner. Per his naturalization papers, he arrived in the U.S. in 1838. Soon after he settled in Pittsburgh (Pennsylvania). In the census of 1850, he is listed as a 46-year-old brewer and inn-keeper from Germany, with his wife May (age 45, born in Germany) and their children (all born in Pennsylvania). He died in 1858; however, his brewery eventually became today's “Iron City” brewery. Franz Xaver Böniz was born on 16 October, 1816, in Endingen (Baden, Ger. ), the youngest son of Anton Böniz (master cooper) and Maria Anna Wagner. During or shortly before 1837: he emigrated to the US, possibly with brother Anton, settling in Pittsburgh, Pennsylvania. 1837: he married Alexandrine Josephine Seeger, from Sutthausen, Hanover [today Lower Saxony], Germany. 1841: they moved to Cleveland, Ohio, where they invested her inheritance from her father in a grocery store. 1860: Franz was sued for unpaid debts; shortly after he left his wife and joined his brother Wilhelm at Fort Ross in California. 1866: Franz joined a group of Californians emigrating to Argentina, where he was a founding member of “Colonia California”, Santa Fé. 1873: reappears in California. 1874: re-emigrates to Argentina with Wilhelm & his family. 1880: Franz died at estancia “La California”, Santa Fé. 1888: Alexandrine died in Cleveland, Ohio. They had 3 children: Amelia (b. 1840, married George W. Ott), Elizabeth (b. 1844, married William McNamara), and William (b. 1845). Johan Evangelist Benitz was born 12 December, 1812, in Endingen (Baden, Ger. ), the son of Anton Bönitz (cooper) and Maria Anna Wagner. He emigrated with his brother Wilhelm (William), arriving in New York City on December 2, 1833. He may have settled in or near Pittsburg, Pennsylvania. Joseph Bennitz (1796, Bavaria), per US census of 1850, born about 1797 in Germany; it was a coincidence that he lived in the same ward in Pittsburg as Anton Benitz. Joseph Böniz (1807, Endingen) was born 4 February, 1807, in Endingen (Baden, Ger. ); he apparently died 25 March of the same year (per cross on baptism record). He was a younger brother to Anton Benitz. Joseph Böniz (1811, Endingen) was born 23 February, 18011, in Endingen (Baden, Ger. ); named in memory of his deceased sibling, he was also a brother of Anton Benitz. Maria Anna Bönitz was born in 1819, Endingen (Baden, Ger. ), the youngest child of Anton Böniz (master cooper) and Maria Anna Wagner. She married Urban Mahrer, probably in the US; they lived in Cleveland, Ohio, close to her brother Franz. In 1874 they joined brother Wilhelm and his family when they emigrated to Argentina. However, Nany and Urban remained only 2 months in Argentina. They returned to the US and lived in Pittsburgh (Pennsylvania), close to her brother Anton. Urban became a well known inventor. Nany died in 18xx. Urban remarried; he died in 1895. Franziskus (Frank) Baumann was born 6 February, 1853, in Endingen (Baden, Germany), the son of Xaviar Baumann and Appolonia Benitz - see her entry for a family tree listing her descendants, including those of Frank Baumann. 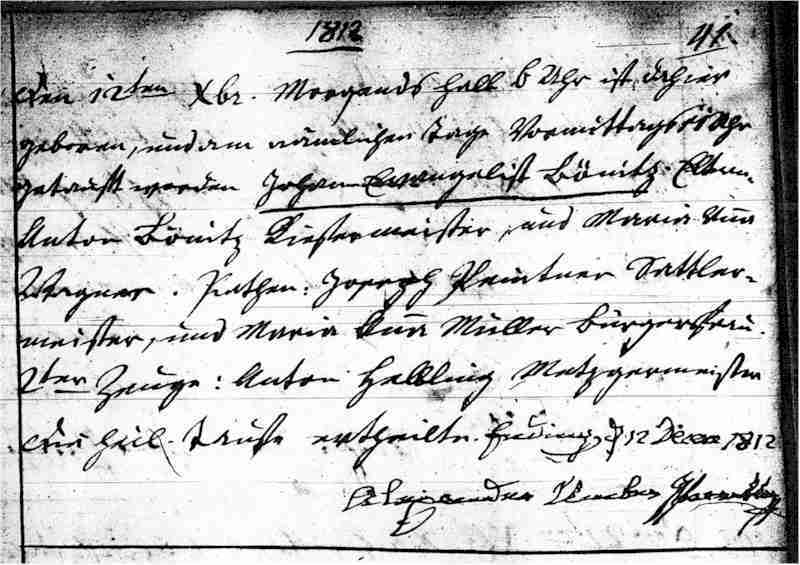 Per the baptismal record (shown below), Johann Evangelist Bönitz was born on 12 December, 1812, in Endingen, Baden, Germany. He was a son of Anton Bönitz (cooper) and Maria Anna Wagner. We know little about his youth. He reappears in 1833 on a passenger manifest: Johann Bennitz and Wilhelm Bennitz, natives of Baden, ages 21 and 18 respectively, were passengers on the ship Utica when it sailed from Le Havre, France, to New York City, U.S.A., arriving on December 2, 1833. The names, ages, and country of birth match those of Johann and his younger brother Wilhelm (William). It is too much of a coincidence to believe it is not them. Johann is not mentioned in the family records. If he wrote to their eldest brother Thaddeaus in Germany, his letters were not preserved. Brother Anton Benitz, in his letter of May 6, 1852 to Thaddeaus announcing he had found William, ends with “As for the rest, Xaver and Nany are, as far as I know, healthy and doing well.” He makes no mention of Johann, which suggests everyone knew of Johann’s whereabouts or fate. In the Pittsburgh City Directory of 1859-1860, there are listed Mrs. A. Benitz (beer hall) and John Benitz (brewer) residing at the same address. Mrs. A. Benitz was almost certainly Anton Benitz’s widow, and John could have been either her 18 year old son or her brother-in-law Johann. According to the Erie County, Pennsylvania Naturalizations, 1825-1906 (pub. 1983 by Erie Society for Geneolocial Research), a John Benitz claimed to have arrived in 1854 – could the year be a misprint of 1834? We have concluded he is not related to the Benitz from Endingen (Baden); that it was just a coincidence that he lived in the same ward (5th, Pittsburg) as Anton Benitz (b. 1803, see above). Per the census of 1850, Joseph Bennitz was from Germany, age: 53 (i.e., born about 1797); occupation: cooper; wife: Susan (age 40, born in Germany); three children: Charles (18, born in Germany), Leopold (16, born in Germany), & Mary (12, born in Pennsylvania). Per the 1870 Census, son Charles was born in Bavaria. Per a descendant of Charles’, the US immigration records show Joseph Bennitz & wife Susan as immigrants from Bavaria, born 1796 and about 1802 respectively; they arrived in New York city on 31 December, 1832, from Le Havre, France, on the S.S. Bayard. Per the US Federal Census Mortality Schedule, he died of dropsy (edema or congestive heart failure) in 1860. In the baptism records of Endingen, Germany (see below), there is a Joseph Böniz baptised on 4 February, 1807, and died 25 March of the same year (signified by the cross in the second column). He was a younger brother to Anton Benitz (b. 1803). In the baptism records of Endingen, Germany, there is a Joseph Böniz, born 23 February, 1811. Brother to Anton Benitz (b. 1803), he was presumably named in memory of his deceased sibling. We have found no other records about him - marriage, children, death, etc. No mention is made of him in letters his siblings wrote to their eldest brother, Thaddeaus, which hints at the possibility that he died young.